Alliance Health can provide your company or workplace with onsite flu vaccinations. Holding an on-site flu vaccinations clinic saves lost work time and ensures greater staff participation as staff do not need to take time off to visit their own doctor. 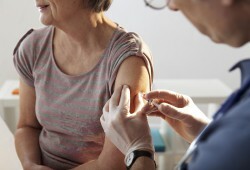 Research shows healthy working adults vaccinated against flu have nearly half the number of doctor’s visits and sick days compared to those who are unvaccinated. Alliance Health provide flexible programs to suit the needs of your workforce. We will visit offices, workshops, industrial sites, large or small. Contact an Alliance Health Coordinator today! Contact our Coordinator today to enquire how we can assist your business to look after your employees and all of your occupational immunisation needs. Or register your interest to receive more information about flu vaccinations in your workplace.